Fiction is a genre which interests a lot of people. There are many popular fiction writers who have written many bestselling novels. Here in this blog, we shall look at the some of the best fiction writers that wrote the best fiction books. These writers and their book are not necessarily popular, but their style of writing has won many critical accolades over the years. The author wrote this 1982 Pulitzer Prize-winning novel in the “Epistolary” style, a novel in the form of letters by one or more characters. This novel chronicles the life of an African American girl named Celie in the post-civil war American South. The character writes letters to God and her sister Nettie. The novel talks about sexual abuse, sexual orientation, sexism, racism, racial disability and social disadvantage. Charlotte Bronte wrote this novel under the pen name of Currer Bell and was published in 1847. This novel can be credited to be the precursor for the now famous “Feminism”. The novel tells a story of strong individualism ideas for women through the example of the protagonist who rises from being poor and orphaned to a successful and independent woman. The author is one of the best fiction writers. And the mystery novel is an African Literature in its finest form. The novel talks about the lives of native African tribes and the impact of British Colonialism which disintegrates the social fabric of indigenous cultures. One of the most notoriously acclaimed authors, Virginia Woolf’s Mrs. Dalloway is idiosyncratic and an unconventional novel where the plot is secondary and the characters take center stage. Through the characters, the author addresses human anxiety, guilt, mental illness, PTSD and the disastrous effects of societal pressures. The voice of African American women, Toni Morrison’s novel won the Pulitzer Prize in 1988. This fiction novel is a spiritual and haunting novel which discusses the trauma of slavery and the adverse psychological effects arising even after achieving freedom. This novel also stresses the importance of how family and community can help alleviate the stress. One of the most influential fiction authors of all times, Cervantes also is the beacon of the brilliant literary heritage of Spanish literature. This single work of art has influenced generations of authors, painters, artists, and musicians. The effect is so profound that we have a phrase “Quixotic”, which means the foolish impractical pursuit of ideas coupled with dystopian romanticism and chivalry. This work of art follows the unlikely blossom of friendship that seems to evolve between the British and Indian people albeit all the communal tensions and political polarization, and cultural differences. The fact that the author traveled extensively in India, makes the novel a beautiful work of art. The most famous of Columbian writers, Gabriel Marquez’s book earned him the Nobel Prize for Literature in 1982. The novel chronicles the seven generations of the Buendia family and their founding of the City of Macondo to the ultimate annihilation and destruction of the city and the family. One of the most influential authors ever to live, Harper Lee’s fiction book earned a Pulitzer Prize in 1961 and was made into an Academy Awards Oscar-winning film in 1962. The novel examines racism in the American South and helped change the perception of the world regarding America. Anna Karenina is the central character of the eight-part novel. The novel tackles subjects like adultery, gambling, marriage plots, Russian Feudalism, the tussle between realism and idealism. The novel is notable for its realistic human emotions and treatment of women. Are you a book collector or an avid book reader? 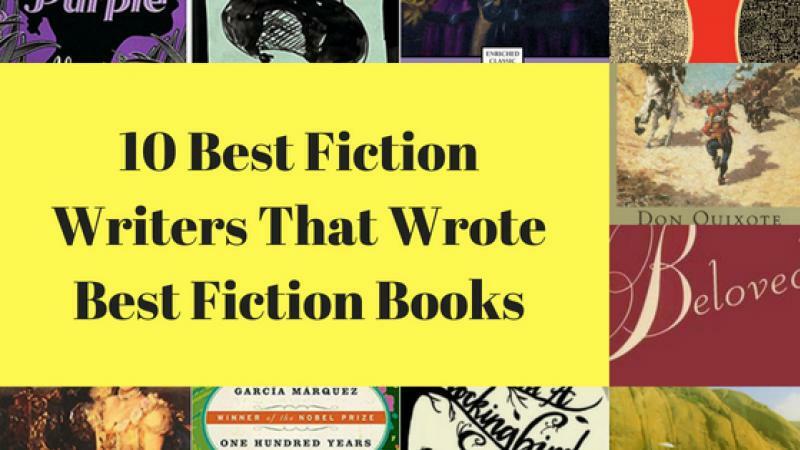 Then you must be knowing about one of these best fiction writers or books. If you have read any of the above-mentioned novels, then please comment your take on these timeless gems of literature. If not, go give them a shot and get ready to be lost. You can find more literature gems like these at this online fiction book store. Discover books from other genres at this online book store.